Webster qualified for the President's Cup by winning its sixth consecutive Pan-Am championship in December. The Webster University chess team's bid for a record-extending sixth consecutive national title fell half a point short as they finished in second place in last weekend's President Cup, known as "the Final Four of collegiate chess." Coach Susan Polgar's team was seeking to extend Webster's streak, having won an unprecedented five national championships in a row. University of Texas Rio Grande Valley (UTRGV) was crowned the new national champion, winning its first title after previously finished second to Webster in the 2016 President's Cup. As is usually the case, the competition was up for grabs till the end. Webster had a chance to claim a share of first place up to the very last match of the two-day, four-team tournament. But a draw in that match meant Webster finished with 7.0 points, half a point behind UTRGV's 7.5. "We always play to win! But when we don't, we accept defeat with grace! That is the Webster way," Polgar tweeted after the final round. "Big congrats to Coach Bartek, UTRGV, and the entire Brownsville Community! Well earned victory!" 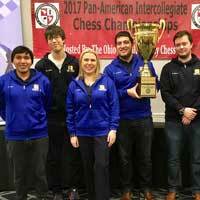 Teams qualify for the President's Cup by finishing in the top four in the Pan-Am InterCollegiate Chess Championships, which take place at the end of the calendar year. Webster has won that tournament a record six consecutive times -- and a second Webster team tied for second place in that tournament, though President's Cup rules allow only one slot per college or university. So the historic streak has ended, but this is a resilient team of Webster students who have thrived amid increasing competition as more universities discover the educational and community impact of chess. The Webster squad at the December Pan-Am fought through a flu bug and 11-hour interstate bus ride through snowy conditions to win that title. Next year they'll aim for Pan-Am title #7, and to start a new streak at next year's final four.